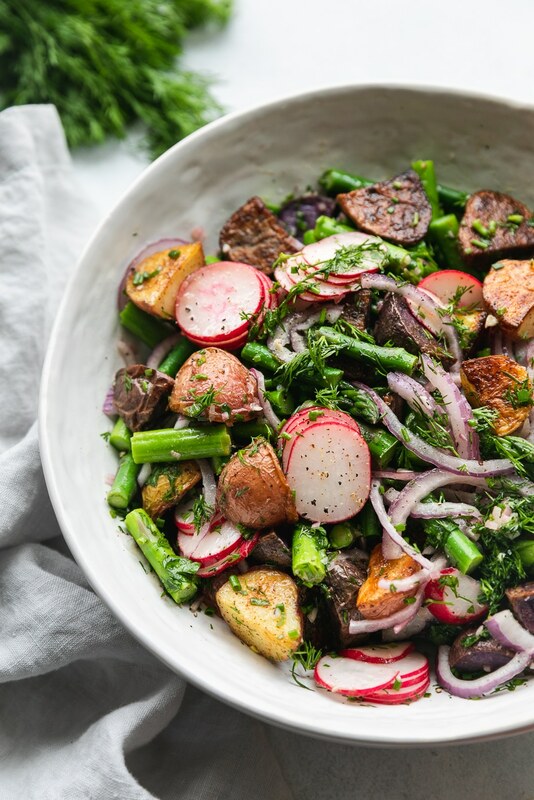 This Spring Roasted Potato Salad is the perfect, flavor-packed side dish for spring! 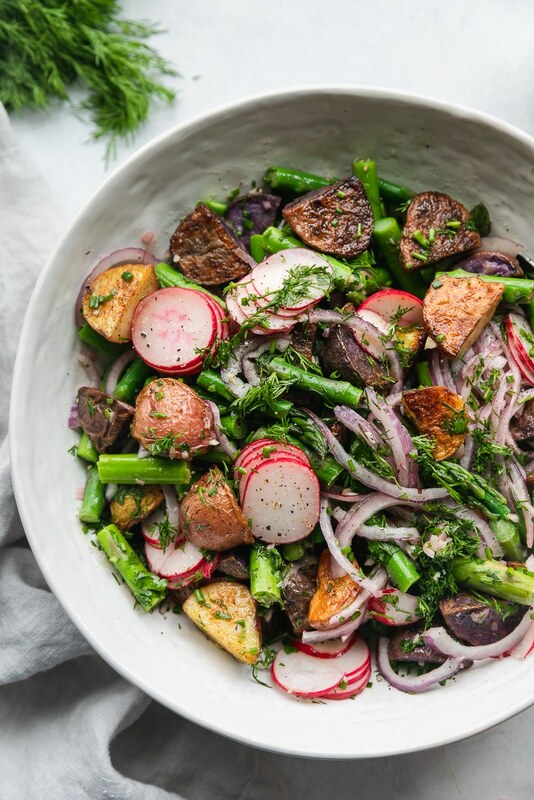 It’s made with crispy roasted potatoes, asparagus, thinly sliced red onion, radishes, lots of fresh herbs, and a lemon vinaigrette. It’s a lighter take on a classic potato salad, and the flavors are so bright and vibrant! I’ve never been one for creamy, mayo-based potato salads. 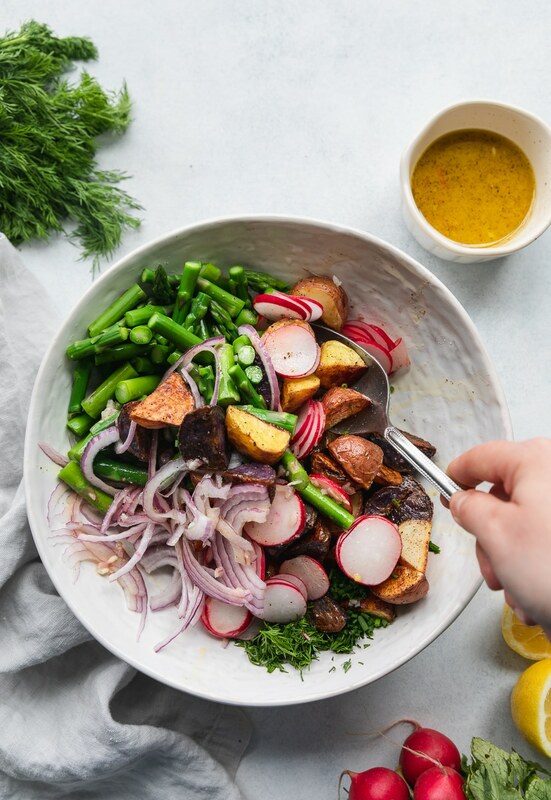 But crispy roasted potato salads with a super bright and flavorful vinaigrette?!?! Give me all of it. I’ve actually never been a fan of anything mayo-based. I think all of the classic American “salads” are kind of gross, honestly. Macaroni salad, egg salad, potato salad..really not a fan. But this one is LIFE CHANGING. I first started playing around with roasted potato salads years ago when I first made this one, and then this BLT one! Both so good and made me fall in love with warm potato salads sans mayo! How could you not want to devour a potato salad made with these crispy beauties?! Since they’re so crispy, this potato salad is best eaten right when you make it, but I’ve also eaten it after its been sitting and it’s still phenomenal. 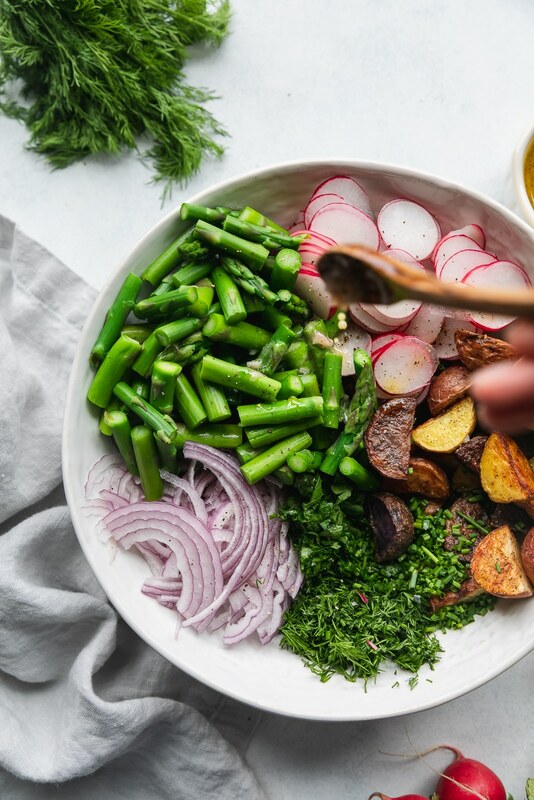 The citrusy dressing mixed with the crispy potatoes, crunchy veggies, and herbs, is just out of this world delicious. This is a perfect side dish for Easter, or you could even have it for brunch and add some poached or friend eggs on top! I’ve also just eaten it for lunch! All of these colors just get me! I can’t even deal with how gorgeous spring produce is. And all produce for that matter. 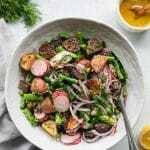 I used red radishes here, but you can use watermelon radishes, french breakfast radishes, or even easter egg radishes to make it extra festive! Whatever is available to you and in season is perfect! I like slicing the onions suuuper thin, because when they get tossed with the warm potatoes and vinaigrette, they get kind of soft and marinated and delicious! It’s amazing. I like to use a mixture of chives, dill, and parsley here. The combo is so bright, fresh, and springy. This is pretty much all I ever want in a spring side dish! 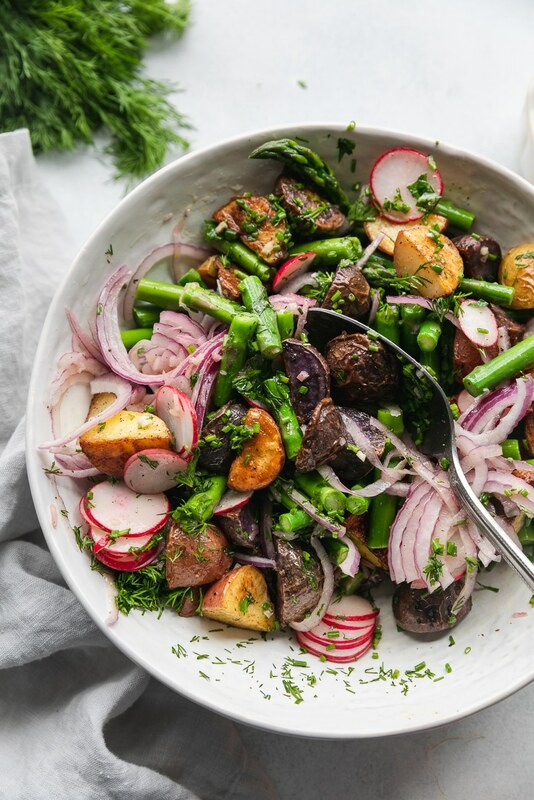 This Spring Roasted Potato Salad is the perfect, flavor-packed side dish for spring! 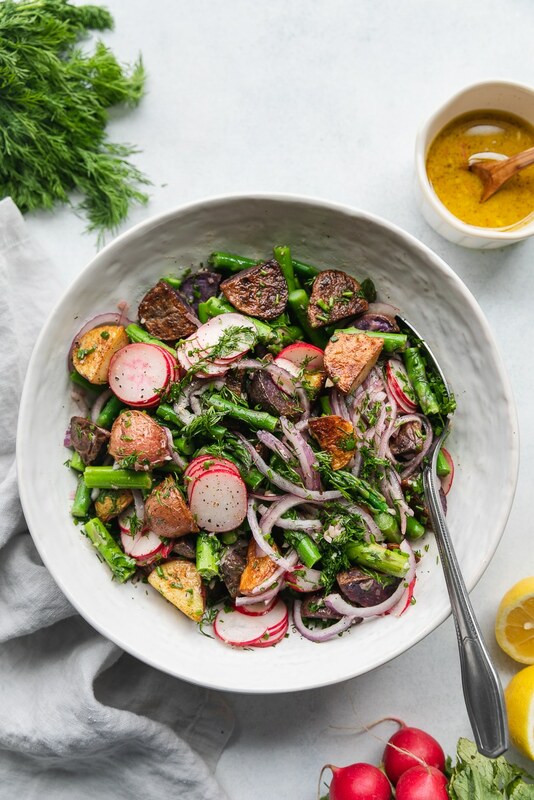 It's made with crispy roasted potatoes, asparagus, thinly sliced red onion, radishes, lots of fresh herbs, and a lemon vinaigrette. It's a lighter take on a classic potato salad, and the flavors are so bright and vibrant! Preheat oven to 425℉. Line a large rimmed baking sheet with parchment. 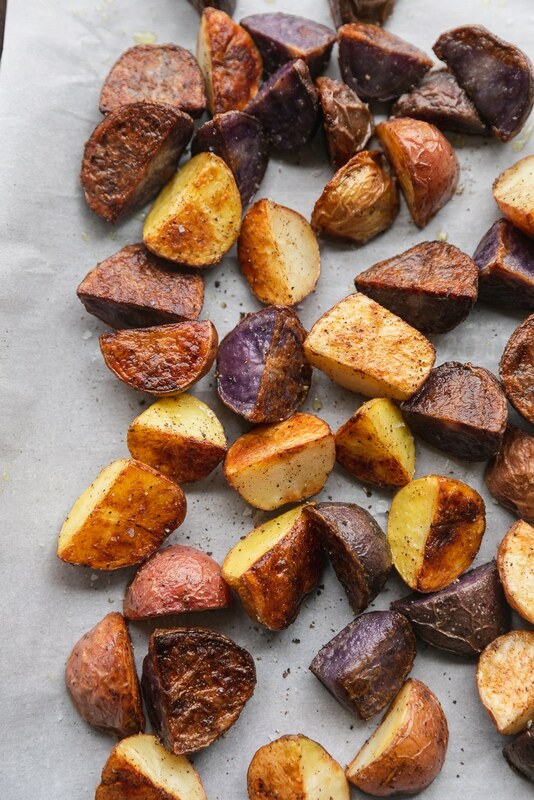 Place potatoes on the baking sheet and toss with olive oil, salt, and pepper. Bake for 30 minutes or until golden brown and crispy, tossing once during baking. While potatoes are baking, being a large pot of water to a boil. Prepare an ice bath in a medium bowl for the asparagus. Once boiling, add the asparagus and blanch for 1 minute, until they are bright green and just slightly tender, then place asparagus pieces immediately in the ice bath to stop cooking. Let them sit in the ice bath for several minutes, then drain. Make the vinaigrette. In a medium bowl, whisk together the lemon juice, garlic, shallot, dijon, olive oil, salt, and pepper. Set aside. 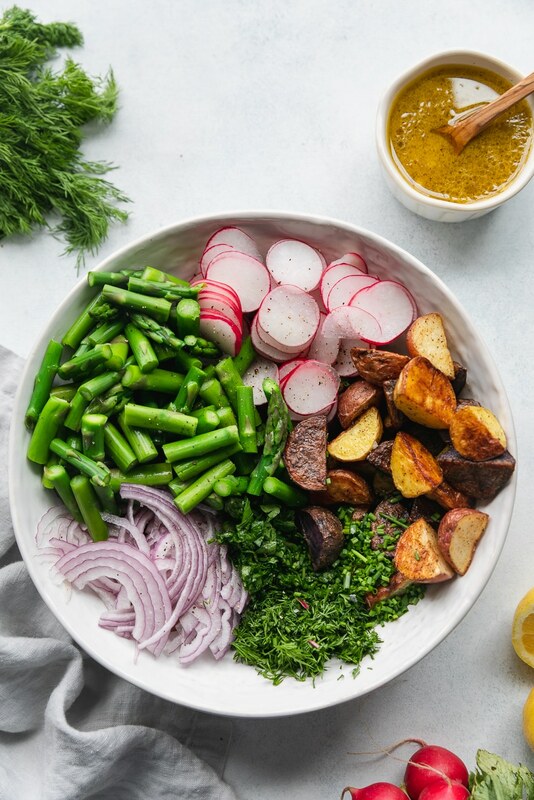 Once potatoes are finished roasting, let cool for a few minutes, then add to a large bowl along with the asparagus, red onion, radishes, two-thirds of the vinaigrette, and a couple big pinches of salt and several grinds of freshly cracked black pepper. Toss to combine. Add the herbs and toss once again. Season to taste with additional salt and pepper if desired. Serve immediately with the extra vinaigrette! 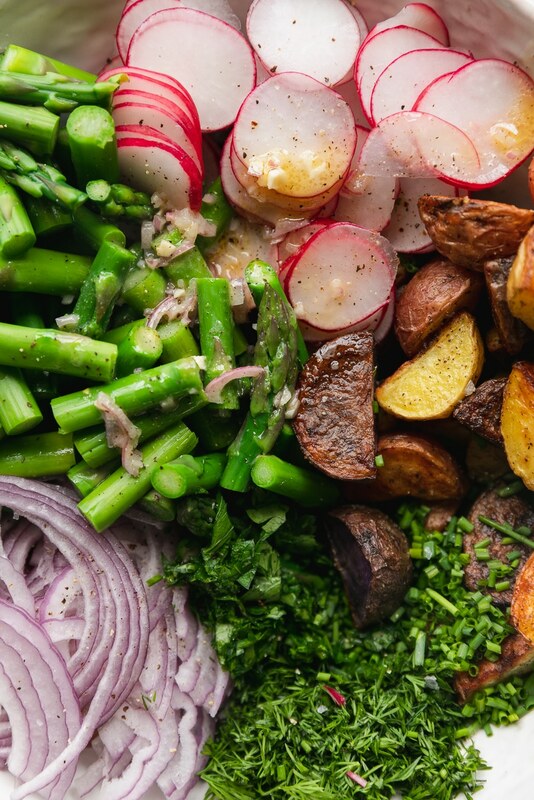 *I love using a multicolored baby potato medley, but you can use whatever baby potatoes you like, or fingerlings!